Stafford Motor Co is a sole authorised distributor for Honda Motor cycles in Sri Lanka brought Honda CB Hornet 160R Motor cycle for Rs. 414,900/- upwards. AHO improves vehicle visibility not only in dawn, dust or fog. But also in bright daylight. Delivers power while providing world class mileage. Keeps your ride stable and comfortable. 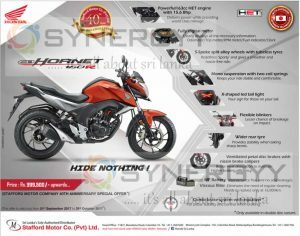 Redefines Sporty’ and gives a smoother and hassle free ride. Better Heat dissipation to maintain higher braking efficiency. 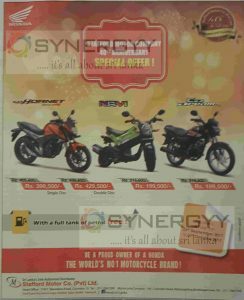 Abans is an authorised dealer for Hero motor bikes in Sri Lanka brought you Hero Splendor ismart 110cc for Rs. 237,000/- upwards. 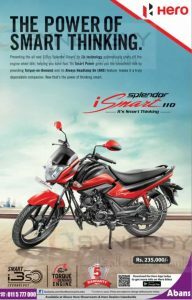 Splendor ismart 110 comes with latest smart i3s technology for better fuel saving and torque on demand engine for better performance. Hero brings to Sri Lanka, the first ever bike with Intuitive i3S technology. The new Splendor iSmart automatically switches off the engine when idle and switches it on as soon as you press the clutch. So go ahead, enjoy the company of your smart companion that saves fuel and protects the environment. 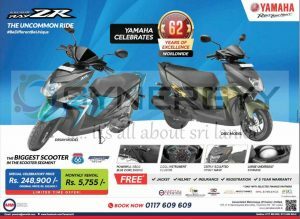 Yamaha Sri Lanka brought latest version of Yamaha Ray ZR Scooter Dark Night Edition into Sri Lanka Market. Yamaha announces a introductory price of this Yamaha Ray ZR scooter as Rs. 267,900/- and leasing optional available as Rs. 6,496/- Per month upwards. Stafford Motor Co. (Pvt) Ltd Sri Lanka authorised agent and distributor for Honda Motor cycles brought a special promotion for Honda Motorbike on this festive season. 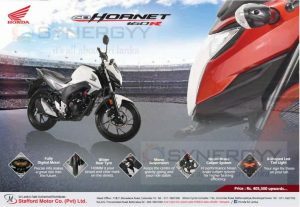 Honda CB Hornet 160R comes with 163cc HET BS IV engine with 15.6 Bhp, Mono suspension with two coil springs and Combi brake system with equalizer. Honda CB Hornet 160R with 5 – Spoke split alloy wheels and Ventilated petal disc brakes with nissin brake calipers make it as an excellent bike. 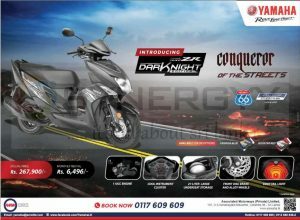 Associate Motorways (Pvt) Ltd is an aunthorised distributor for the Yamaha Motor Cycles in Sri Lanka brought you the biggest scooter in the scooter segment to Sri Lank at an affordable price of Rs. 248,900/- Monthly instalment is available from Rs. 5,755/- onwards. 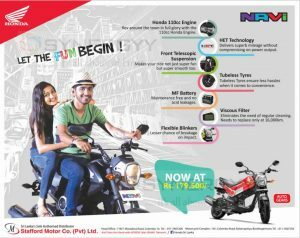 Stafford Motor Co (Pvt) Ltd announces a special price for Honda Navi Standard Version for Rs. 179,500/- (all Inclusive). Honda Navi is one of the well suited Motor cycles for Sri Lanka with better fuel efficiency. Rev around the town in full glory with the 100ccc Honda Engine. Delivers superb mileage without compromising on power output. Makes your ride not just super fun but super smooth too. Tubeless Tyres ensure less hassles when it comes to convenience. Maintenance free and no acid leakages. Eliminates the need of regular cleaning. Needs to replace only at 16,000km. Lesser chance of breakage on impact. Abans brought you Hero Splendor iSmart to Sri Lanka at a price of Rs. 235,000/-. Hero Splendor is well known motor cycle in decade back for their fuel efficiency and comfort, the same model has been updated with latest features and come as Hero Splendor iSmart for this generation. 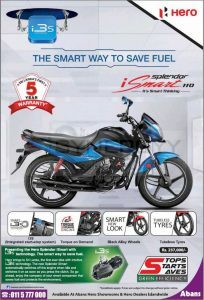 Presenting the all new 110cc Splendor iSmart with i3s technology automatically shuts off the engine when idle, helping you save fuel. Its Smart Power gives you the smoothest ride by providing torque on demand and its always headlamp on features makes it a truly dependable companion. 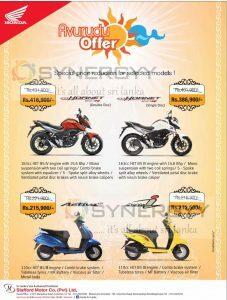 Abans is an authorised dealer for Hero motor cycles in Sri Lanka brought you a special promotional price of Rs. 229,999/- on this New Year season. 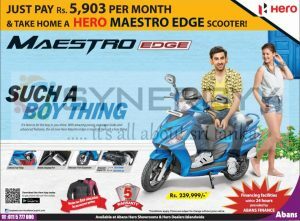 Hero Maestro edge is bigger and much more comfortable than other motor bikes available in that range. 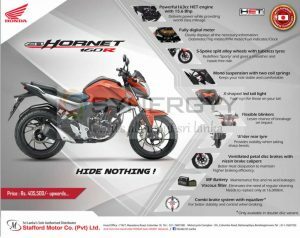 Stfford Motor Co (Pvt) Ltd announces their new price for Honda CB Hornet 160R as Rs. 405,000/- upwards. The offers valid still the stock last. Mono suspension with two coil springs to Keeps your ride stable and comfortable. 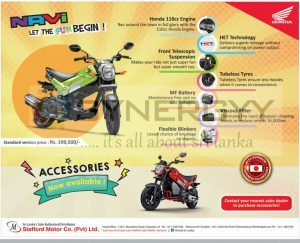 Stafford Motor Co (Pvt) Ltd announces a special price for Honda Navi Standard Version for Rs. 199,500/- (all Inclusive). Honda Navi is one of the well suited Motor cycle for Sri Lanka with better fuel efficiency. three-wheeled autos are replaced soon with environmental friendly electric three wheelers under the Enterprise Sri Lanka: Blue Green imitative. Sri Lanka’s 1.5 million three wheeler drivers will get an opportunity to become owners of brand new electric three wheelers under a scheme proposed by Minister Mangala samaraweera’s budget in Parliament on Thursday. It has proposed to provide loan facilities for leasing electric three wheelers in the ratio of 10:90. Anyone can purchase electric three wheelers by paying 10 percent of its value up front under this scheme. The government will also take measures to export the used fossil fuel trishaws to needy countries like Bangladesh, as this country has already expressed willingness to import those used trishaws from Sri Lanka. Further, the green three wheeler service will be made a mode of transport for foreign tourists by providing necessary training for tuk tuk drivers with licence from the Tourist Board. Although riding in a tuk-luk at present has become more messy than comfortable, this new intiative will make it a convenient trade of transport and brand for a true, Sri Lanka experience with a smile. Provides stability when taking sharp bends. 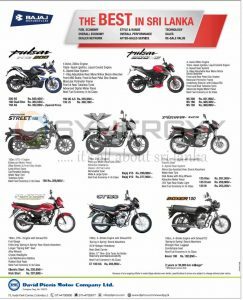 David Pieris Motor Company brought you Bajaj Motor Cycles in Sri Lanka announces their new updated prices for Bajaj Avenger Street 150 Model for Rs. 359,600/-. Associated Motorways (Private) 2 model Yamaha Ray ZR with Drum and Disc Break Models for your own choice for Rs. 248,900/- and easy monthly payment of Rs.5,755/- upwards. Stafford motors brought a latest stocks of Honda CBR 250R motor cycles with an attractive price tag of Rs. 685,500/-. 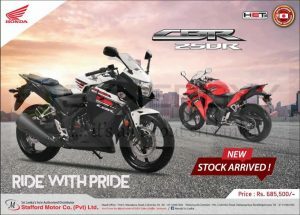 Honda Automobiles has developed the Honda CBR 250R with aim of realize an attractive quarter model that can meet the demands of the times to come and provide customers all over the world with joy and at an affordable price. Honda passion is embodied in various aspects of this motorcycle such as its displacement, frame size, driving stability, and riding position. These features were optimized for riders of all kinds, from beginners to experienced riders, so that they can feel the fun of maneuvering, which is fundamental to motorcycle riding. A sporty feel that riders get the moment they mount and ride the motorcycle is pursued without sacrificing ease of use, in search of the optimum balance between the two. Nimble acceleration that can be felt the moment the throttle is opened, a feel of smooth rev-up in the high-speed range, linear vibration characteristics that do not discomfort riders, and a variety of equipment features such as a rear grip that provides a sense of comfort when riding in tandem-with this list of features, we are confident that customers will be satisfied without exception. Stafford Motors Co (Pvt) Ltd announces a special discount up to 31st October 2017 to make their 40th Anniversary of Automobile sale. With all the above price reduce don’t forget to get a FREE full tank of petrol. 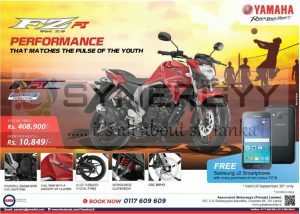 Yamaha Sri Lanka brought you a Yamaha FZ S Version 2.0 for Rs. 408,900/-, Monthly Instalment of Rs. 10,849/-. The Yamaha FZ Series set a new benchmark for biking. The FZs (FI) Version 2.0 takes it to the next level. It brings the most advanced Yamaha Blue Core concept to offer bikers an unmatched experience of performance and efficiency. At its heart is the all new Yamaha Fuel Injection (FI) engine. It uses advanced sensors and actuators to calculate and deliver the optimum amount of fuel to the engine – enhancing both performance and mileage. The reduced weight (132kg) makes the bike even more responsive leading to quick initial pickup and delivering smooth passing acceleration. The all new YAMAHA Fuel Injection(FI) Blue Core engine of YAMAHA FZS FI uses advanced sensors and actuators to calculate and deliver the optimum amount of fuel to the engine – enhancing both performance and mileage. New 149cc engine with a compact hemispherical combustion chamber designed to deliver better fuel economy and acceleration performance has been developed. It achieves a 14% improvement* in fuel economy. The bore x stroke dimensions are 57.3 mm×57.9 mm, making it a relatively small bore engine, and its intake/exhaust valve layout is designed to best match the hemispherical combustion chamber. In combination with the optimized intake and exhaust port shapes, this design increases combustion speed and helps achieve excellent combustion efficiency. The new engine further improves fuel efficiency and the feeling of acceleration while retaining the excellent performance qualities of the current FZ engine. The rectangular layout of the multi-function instrument penal houses tachometer, odometer, single trip meter, fuel level indicator and speedo. The instrument cluster also has a big green indicator which is the ECO lamp. In terms of styling FZS FI is a generation ahead of its competitors. It looks compact as well as macho. It also confirms you a safe and enjoyable ride with its braking system. The split seats add convenience to the ride. The rear seat can be opened up to access the under-seat storage. The newly designed muffler protector further adds to the impression of sharpness. The broad tyres and perfectly mated suspension keeps the bike grounded on high speed and sharp corners even in wet weather. The puncture resistant radial tyres can digest most of the potholes easly. The racy stripes on its rims give it a very sporty and cool look. Easy to grasp aluminium handle grab bars the handle grab bars are positioned in such a way that it’s easier to grasp them for a more relaxed position while driving with a perfect palm grip. 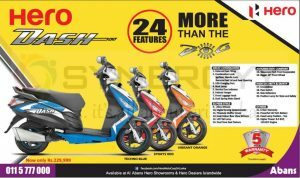 Abans introduce Hero Dash 110cc powered engine scooter now available for Rs. 229,999/- on 3 vibrant colours of Techno Blue, Sports Red & Vibrant Orange. Compact Muffler – 2-piece silver finished muffler brings out the sporty character of the bike. X- Shaped LED Tail Light – New generation X-shaped LED tail light precisely designed tail lights enhances the rear look of the bike. Wider Rear Tyre – A true street sports bike is further justified with the 140mm broad tyre which not only looks good but also increases the stability. 5-Spoke Split Alloy Wheels – Only one of it’s kind, split alloys are fulfilling the desire of being sporty & futuristic. Combi Brake System (CBS) – Daily commuting has been made reliable by equipping Combi Brake System (CBS). You can pull the throttle and enjoy the ride while feeling safe with CBS, as it reduces braking distance & maintains stability. Dual Petal Disc Brakes – Front & Rear Discs have been cut into petal shape to dissipate heat which maintains the braking efficiency. BS-IV – CB Hornet 160R is among the first few mainstream bikes in 150-180cc to meet BS-IV norms. 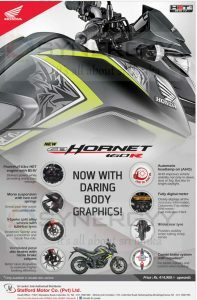 160cc HET engine – CB Hornet 160R’s engine been designed to give perfect combination of high mileage & brute raw power. It’s engine has several advancements like- Long Stroke, High Compression Ratio, Spiney Sleeves, Needle Bearings & Weight Balancer. Offering convenient and flexible vehicle financing offers, Nations Trust Bank (NTB) recently introduced the lowest ever motorbike leasing solution to the market with an interest rate of 24% per annum, with a short response time of 24 hours. The new leasing solution will enable middle income families to purchase their dream motorbike which was previously unaffordable, in a hassle free manner within a short period of time. Nations Trust Bank operating with a policy of offering customers an unprecedented service experience has added ample features to enact and facilitate middle income families to make leasing a viable solution for them. Nations Trust Bank PLC is ranked among the top 25 business establishments in Sri Lanka by Business Today magazine and its market positioning of being the benchmark of customer convenience, is ably supported by a host of financial products and services offered to a wide range of customers.